Larry Hjermstad of Western Weather Consultants said the idea behind cloud seeding is to vaporize silver iodide into its molecular form and allow the wind to carry it up into an appropriate cloud formation where moisture collects on it, forming snow or raindrops. Larry Hjermstad of Western Weather Consultants said there are around 38 of his cloud-seeding machines spread throughout the San Juan Mountains. When Mother Nature brought snow to the San Juan Mountains late Thursday, Larry Hjermstad fired up clouding-seeding generators to increase the bounty. Hjermstad, calculating wind direction, started generators near Lemon Dam and Bayfield to benefit Purgatory at Durango Mountain Resort. 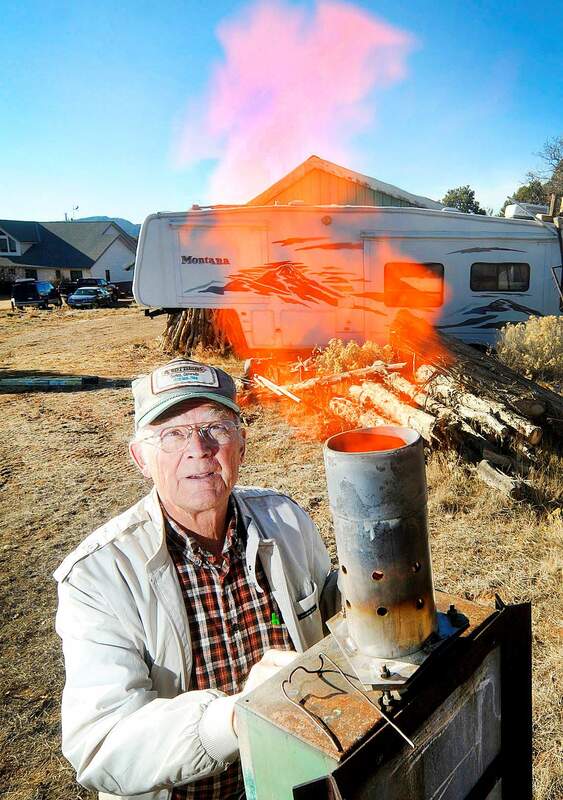 He planned to fire up other generators in southwest La Plata County early Friday to try to increase snowfall in the general area. If conditions are favorable, he plans to add generators this afternoon that could augment precipitation around Telluride. Hjermstad says cloud seeding can increase snowfall 12 to 35 percent. As the principal of Western Weather Consultants, he has been in winter weather modification since 1966. In fact, his field of concentration in his atmospheric science degree from Colorado State University was exactly that. 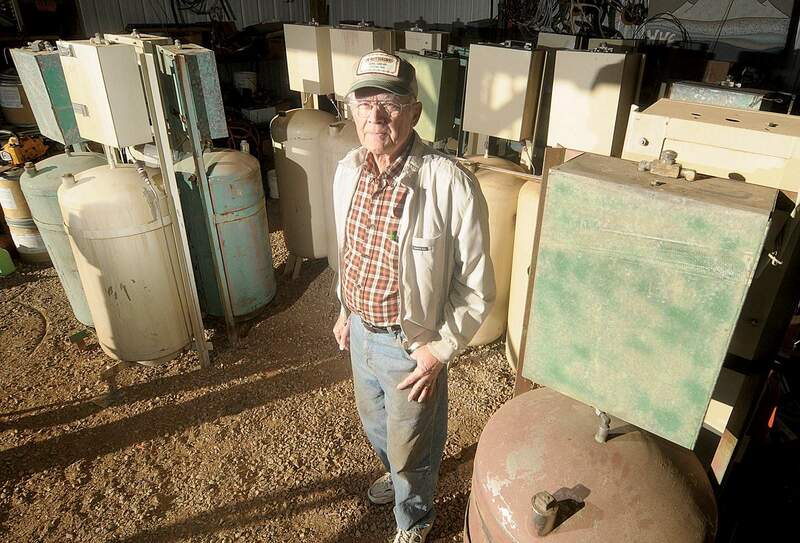 Southwestern Water Conservation District has supported Hjermstads program for decades. Southwestern matches whatever donations participating water agencies contribute. But the same agency, carrying out weather modification projects in other nations, has found some intriguing results, the website said. The experiments were done in Argentina, Australia, Italy, Mali, Mexico, Saudi Arabia, Thailand and South Africa. Attempts to influence the weather arent new. The struggles of man against the elements are found in the magic, myth and religion of ancient India and Greece. Scientific weather modification has been around since the 1950s and is done by airplane and land-based generators. 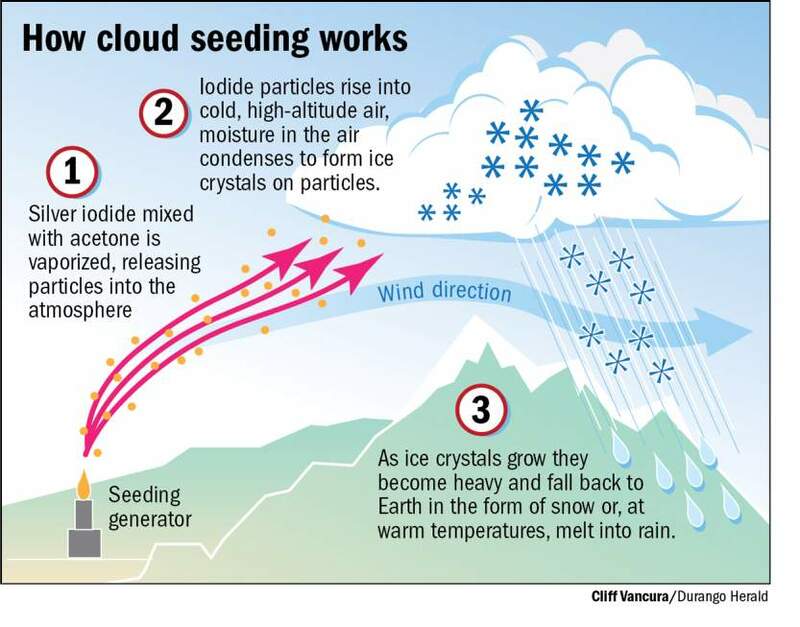 Cloud seeding by generators to produce snow involves filling the base of clouds with quadrillions of particles of silver iodide around which cloud moisture coalesces to form snowflakes. Hjermstad has a network of generators that stretches from Chama to Telluride and an equal number in the headwaters region of the Colorado River. The generators are located at the homes of ranchers, farmers or simply people interested in weather modification. When seeding conditions are right for a certain locale  low clouds and low temperature are required  Hjermstad alerts the indicated collaborators and tells them when to turn on their generator and what seed rate to use. A generating station consists of a tank containing silver-iodide powder dissolved in acetone. When the tank is pressurized, the liquid is sprayed through a flame where the acetone vaporizes. The particles of silver iodide that form in the cold air  theyre one-tenth the diameter of a human hair  are carried by the wind into the clouds, there to bind with moisture. Interestingly, the molecular structure of silver iodide and ice crystals are 95 percent alike, Hjermstad said. The number of particles that one gram of silver iodide produces is one followed by 15 zeroes, Hjermstad said. We normally seed five to 25 grams of silver iodide per hour. The cost of seeding, Hjermstad said, is borne by the end-product beneficiaries  water districts, ski resorts, the Colorado Water Conservation Board, the Lower Basin states of Arizona, California and Nevada that use Colorado River water and the state of New Mexico. People who operate the generators can earn $500 to $1,000 per season, Hjermstad said. Hjermstad, from 1970 to 1975, managed the Colorado River Basin Pilot Project, a Bureau of Reclamation weather-modification research project in the San Juan Mountains. He has seeded clouds as Western Weather Consultants since 1976. Hjermstad monitors numerous sources to determine when conditions are right for cloud seeding. Among those on his radar are the National Weather Service, the Colorado Avalanche Information Center, the National Oceanic and Atmospheric Administration, the Colorado Climate Center at Colorado State University and computer models developed by science departments at Texas A&M University and the universities of Wyoming and Utah.